This portobello burger is pretty high up on the list of my favorite burger/sandwich combos. That may not mean much coming from a gal who loves pretty much all sandwiches. No discrimination here! But this burger really is magic. For one, it's super filling. But also it tastes like a legit burger. The texture is awesome. It's hearty. It's flavorful. It's GOOD FOR YOU. 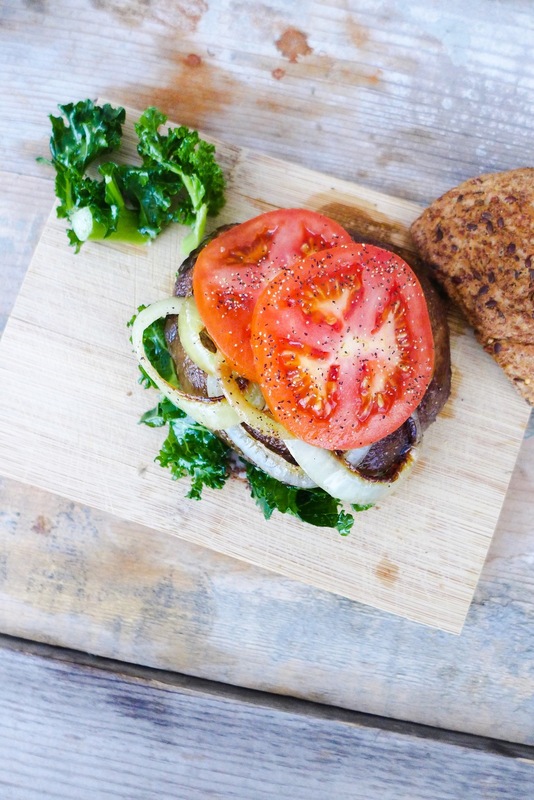 Seriously, give this burger a shot for lunch or dinner sometime this week. You won't be disappointed! A healthy, plant-based take on a traditional American food. 1. Heat coconut oil in a skillet over medium heat. Once melted, add the portobello cap (smooth side up) and the onions. Cook for 6-8 minutes, flipping the mushroom 2-3 times, or until tender. 2. Toast the bread if desired. Toss the kale with olive oil until it is evenly coated. Sprinkle with salt and pepper. 3. Layer the sandwich starting with the kale on the bottom, then the mushroom, onion, tomato, and finally the avocado mash. Sprinkle with more salt and pepper as desired.